Prysmian trefoil cable cleats suit 24-76mm cable diameters and are specified for installing three single core cables in trefoil formation. Prysmian trefoil cable cleats are available with single or two bolt fixing. Prysmian BICON trefoil cleats can be used at a maximum fault current level of 30kA RMS if spaced at 900mm on straight cable runs and 300mm on vertical bends and horizontal bends on each support with, if necessary, intermediate unanchored cable cleats to limit resistance spacing to 300mm. Trefoil cable formation is installed where three phases are carried by three single core power cables rather than a single multicore cable. Installing three single core cables using trefoil cleats minimises the induction of eddy currents and maintains current carrying capacity of the circuit. T&D distribute the complete range of Prysmian (BICON) cable cleats including mulicleat, trefoil, claw, hook, single and two bolt cleats manufactured from plastic nylon (LSF), stainless steel and aluminium for LV-HV cable support and containment in short-circuit conditions. Prysmian BICON trefoil cable cleats are installed to provide cable clamp and support restraint to single core cables laid in trefoil formation, especially single core XLPE AWA aluminium wire armoured cables to BS5467 and BS6724. 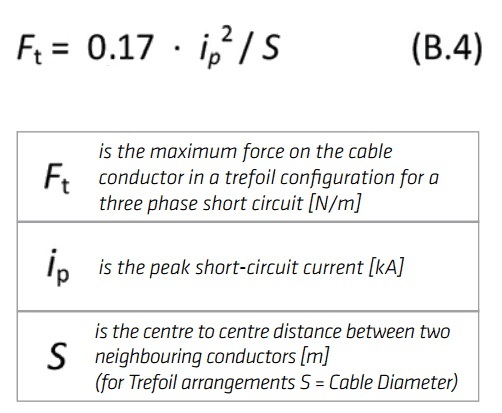 BS EN 61914: 2009 (IEC 61914) provides a formulae which allows electrical engineers and specifiers to calculate the maximum force on a cable conductor. Short circuit tests in accordance with BS EN 61914: 2009 (IEC 61914) are performed on the most critical cable cleat size within its cable acceptance range. The cable cleat calculation formula can then be used to calculate the maximum forces generated during the short circuit test. This maximum force figure can then be used when specifying alternative configurations of cable size and fault current. Voltages are induced in the sheath of power cables running in parallel which result in circulating currents flowing in the cable sheaths. The distances between single core cables running in parallel determine the voltages induced. With single core cables in trefoil formation (touching each other) the distances between the cables are minimum and thus the voltages induced are minimised and hence the circulating currents - the circulating currents cause localised heating. Epoxy coated trefoil cable cleats are recommended for industrial, hostile, polluted and hazardous area cable cleating applications including oil, gas, petrochem and water treatment projects. Trefoil cleats must be spaced at calculated and regular intervals and able to withstand forces generated by short circuit circuits in 1,000 volt, 3.3kV, 6.6kV, 11kV and 33kV cable systems. 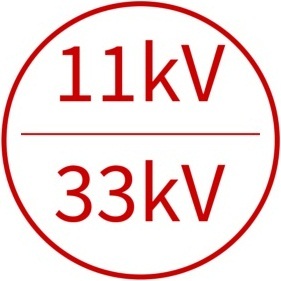 Maximum short circuit current values apply to each design of trefoil cable cleat – if a LV, MV or HV cable system includes larger cables or has a lower fault current the cable cleat spacings can be increased. As a general rule a maximum cable strap/cleat spacing of 900mm is recommended for trefoil cable cleat installations – contact T&D to discuss your cable cleat requirements.